DK's Stone Statue is a board hosted by Donkey Kong and Diddy Kong in Mario Party DS. 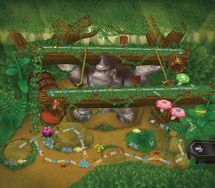 The board resembles DK's Treetop Temple from Mario Party 8. The Star is always located on the third floor of the stage in the second to last space (because the last one is a Bowser Space). The player can buy multiple number of stars, similar to Faire Square from Mario Party 6. Also, there are two ? Spaces on each log that DK is holding up. They make a barrel come crashing down onto the log, and any player who is currently on the log loses 10 coins. There is also a beehive in which the player can collect many coins from the bees. In story mode, the player finds Diddy Kong very troubled. When they find out what the trouble was, Diddy tells them that Dry Bones turned DK into a statue. The player must play against Dry Bones in the Hexoskeleton minigame, to revert DK back to his normal state. If player wins, the player will gain a third Sky Crystal and will be able to go to Kamek's Library. On this board the player gets the stars from the Star Splurge Space. When he or she passes by this space, he or she gets as many stars as he or she wants, if he or she has enough coins. Stars cost 20 coins each on this board (five if the spinner shows Stars for 5 coins in the Final 5 Frenzy). This page was last edited on August 24, 2018, at 10:07.